Site of the LORAN station on Falalop. The tall post to the left was the antenna tower. “The Coast Guard LORAN station started on Potoangroas during the latter part of World War II,” Mariano explains. “The purpose of this LORAN (Long Range Navigational Signal) was to aid the US Navy and other branches of the US armed forces as they moved through the Pacific. Most of the suitable islands to put it on were crowded, so Potoangroas was selected as the initial site for the LORAN station. "I remember the Coast Guard time in Potoangroas," Juanito says. "There was a time I stayed with the Coast Guard. I was 4 or 5, and this black man, he asked my parents and the chief if he could adopt me and stay at the Coast Guard station, and he wanted to take me to the States and have me go to school there. So he started teaching me, and I learned table manners and those things during that time I stayed with him. "Until the time that he was going back and the chief and even the priest said I was still too young to go. He left that night. He brought me here to Mogmog and we spent the night here. Around 4:00 in the morning, that’s the time he said farewell, because he didn’t want to stay until morning when I got up—so they left at night. He and my father went—it was low tide, and they walked back to Potoangroas. And in the morning, they took him over to Falalop and he flew back to Guam." The northern reef, with Mogmog in the foreground. Potoangroas is the other large island. Photograph courtesy of Bruce Richmond, U.S. Geological Survey. "UN team member on Ulithi, 1971." Note the tower in the back. Photograph from the TTPI Archives. "The Coast Guard people were nice," says Mariano, who remembers them from Falalop. "Of course they had to make friends with the people. Usually the people they knew were the chiefs, island leaders. And the local helpers and their families. "I cannot say exactly how many people there were, but usually there was the skipper, a chief, a chief petty officer, two cooks, four ET’s—electrical technicians—and a chief mechanic. Sometimes they had an assistant chief mechanic. And of course they had a doctor, medics, corpsmen. There were no women, but there used to be a couple of women officers who would come in and spend a few days. That was usually for a big occasion, like a graduation, but I never saw women stationed to serve out the term. "There was a big Coast Guard ship but it was not stationed here. It would go around and then come back here. But their planes came every week, bringing in supplies and taking out mail. By that time, people here were still not using postal mail. We usually hand carried letters to places, even to Yap, by boat." 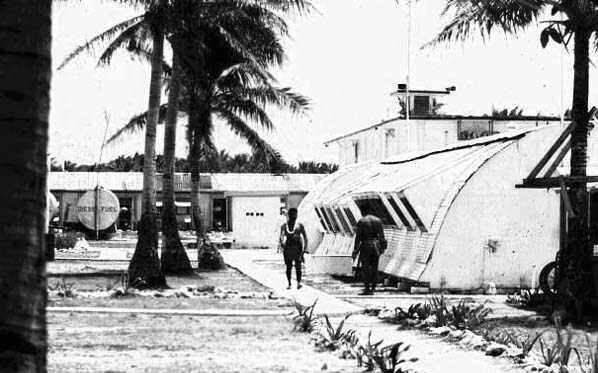 "Ulithi Loran Station, 1970." Photograph from the TTPI Archives. "What was more helpful, during the Coast Guard time, was that we could be warned ahead of time for oncoming typhoons, and even tidal waves (which we never experience in these islands). But they usually gave out the warnings. Sometimes their equipment would just pick up an oncoming disturbance, then they’d run down to the village on their trucks and start evacuating the villagers to the big concrete building. People, families, everybody, they would just spend the night there and nothing happened. I guess it has to do with the deeper parts of the ocean around our islands. "But they used to pick up like oncoming tidal waves and would just rush in and ask everybody to come out there. For oncoming typhoon, while there was still time. But they usually kept the people posted on the new developments of storms and so on. Also, they were really helpful in medical evacuation." “When I was young my family traveled between Asor and Falalop, so if we moved to Falalop for one or two weeks, sometime just a half a week, a couple of days, I mean, I had more chance to watch the Coast Guard movies than those other Asor kids. 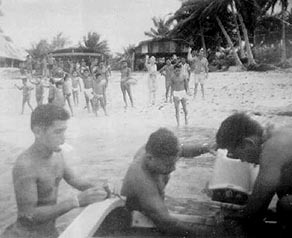 They remained on Asor almost all the time, until special occasions when all the people from around the atoll gathered to Falalop to join the Coast Guard in celebrating an event. "Whether it’s Christmas, whether it’s the 4th of July, they usually called in the people. Then people would have a feast and they would celebrate, every island performed dances. And then they would show the people movies in the evenings. "Out on what is now the high school area, that was their side of the island. The high school started on Asor in 1963. And even at that time, the practice was still going on: for big events, they called the people in." The former Coast Guard recreation hall on Falalop, where movies were shown. 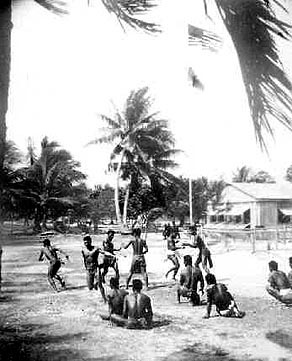 "Students in relay race, Ulithi" ca.1963. Photograph from the TTPI Archives. "Although I was speaking words out of these movies, sometimes I came out with the right word. "And then finally, when we got up to about grade four, we could talk to the Coast Guard. Even though it was in pidgin or whatever, we could communicate. ‘You want some shells?’ we would show them the shells. They would pick a shell. ‘What do you want?’ they would ask. ‘Soda,’ or ‘candy’. Or chewing gum. "Meanwhile the students from the other islands would be just biting their nails, depending on us to do the transaction. And then afterwards we could share with them the bubble gum or chewing gum or whatever. 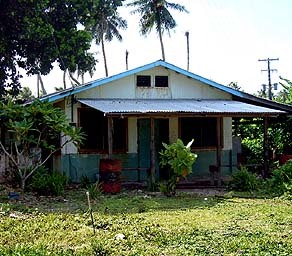 "So there was a very big difference in terms of understanding English with students of Falalop, compared to the rest of the students around our Ulithi Atoll." "Asor Elementary School class session, Nov. 4, 1963." Photograph from the TTPI Archives. 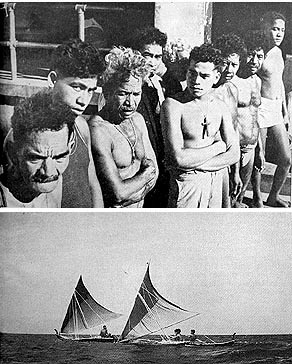 "Six Ulithi sailors who lost their course and drifted to the Philippines with James C. Boykin (teacher trainer, Ulithi) and Liaison Officer Gordon Findlay. 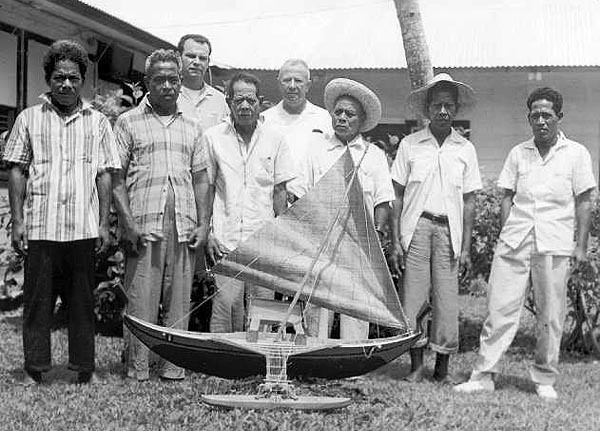 Left to right: Johanes Yguy, 42; Luis Yoloreg, 46; J.C. Boykin; Joseph Yormar, 62; Pablo Hasgur, 60; and Pedro Yamalmai, 34, navigator. Navy photo, 1963. Model canoe in foreground." TTPI Archives photograph. "People before, when there were still many sailing canoes, people tended to sail to Fais more often. Sometimes they got lost, especially when they got hit by a storm. And when this happened, then the Coast Guard would take part in the search-and-rescue. And I guess it was too costly for them. So they tried to stop these trips, so to stop the rescue from happening." "Between Ulithi and Fais is only about fifty miles, but people would encounter storms and they drifted to the Philippines. And the Navy or Coast Guard spent so much time and money to bring them back. It would be much easier just to bring those people home from the Philippines. "But usually they would never let go of their canoe. And it’s quite expensive to bring the canoe and the survivors. Even though the canoes are in pieces, they know they can still fix them, put them back together. They wanted to bring the canoes with them. They wouldn’t want to part with that. Each clan owns a certain canoe, and they didn’t want to come empty-handed and face the leader of the clan. But you cannot fit it into the plane with all these outriggers and stuff. "At that time people were still making canoes, but they were somewhat discouraged from building ocean-going canoes. So they were building smaller size canoes, just for inter-island travel. Ocean-going canoes, mostly they were built on Yap, then taken out here, and if it needed repairs, it could be repaired here. 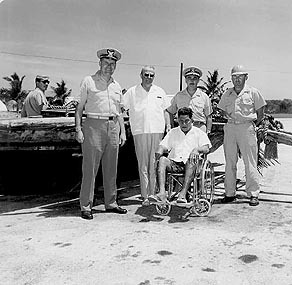 "Guam: Navy officials and Gordon Bradley (white shirt) with Ulithian (in wheel chair) standing by canoe from Fassarai (Ulithi Atoll) that drifted to the Philippines. 1964. V.T. Thompson, Photographer." TTPI Archives Photograph. The navigator in the wheelchair has been identified by the name Dock. 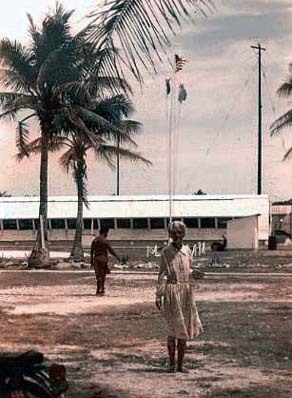 "Ulithi sailor inspects canoe Guam, 1964." V.T. Thompson, photographer. TTPI Archives photograph. "This had a big impact on the navigation skills in Ulithi, because the sailing canoes were neglected and they started to break down and were never repaired. Then people started looking at these cumbersome plastic boats, fiberglass boats. ‘Oh, it’s faster to travel from Falalop to Fedraey—only half an hour.’ So people started turning to the boats without repairing the canoes. The canoes were just left neglected. "That time the first introduction of plastic boats into Ulithi, people were still using the paddling canoes. But then the value of having a canoe started to fade away. Now people turned to the boats. And with the fading away of the canoe, the navigational skills went with them. "I’d say this was late 50’s to early 60’s. Because in 1960 when the typhoon hit Ulithi, the canoes that were damaged, most of them were not repaired." People started buying the commercial wood or lumber—plywood, commercial planks—and they started building their own wooden boats. We started up with all those wooden boats. "And then finally plastic boats started coming in, and that’s when they started neglecting the canoes. So now we can sail to Fais on a plastic boat, but I can tell you that we’re not going to be sailing observing the stars. We’ll be sailing by the GPS. "Some people came to sail even after the war. 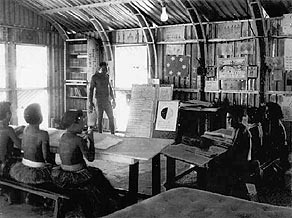 But during the Navy administration started setting up in Yap, and branching out to the smaller islands in terms of having representatives to have on maybe on smaller islands. That’s when they finally put a stop to the sailing of canoes." "When I came back from school," Hosay says, "we were still using local canoes, but that’s the time that we started forgetting about these local canoes and we went for boats." In 1954 these sailors had set out for a trip to Fais to trade for tobacco, but a storm drove them to Samar in the Philippines. From Walter (1954). From left to right: Lorsemal, Olofai, Iloreg, (unidentified), Jesus Tagot (with cross), Hasgur, Ilolmar, and Vincent. "Students depart in boat, Ulithi, 1963." By this date, the changeover from canoes to boats was well under way. TTPI Archives photograph. "I think between sixties and seventies, it seems that the changing was really becoming more rapid than before. It seemed that we were just competing. If somebody would get a new thing, then the other guy would try to get different one, these new things that were coming in." “Canoes we were still using at this time,” Alphonso recalls. “The people in Asor were the first people who started using metal boats and boats with an engine, which they built it themselves. 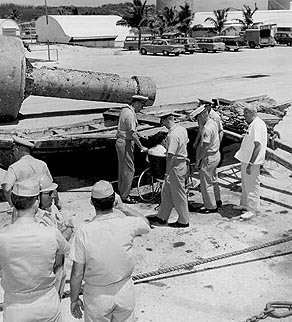 When the Navy or the military left, there were some water pump machines that were left over. "So what they did in Asor, there was an old man at the time, they built the boats, real boats, and took these machines and put them inside and made shaft, and bored the hole out through the back, and that’s what they used for inboard motors." "Several of these boats were used. And by that time, in Ulithi, every island had a store. Falalop, Asor, Mogmog, Fedraey, they are all had their own stores." 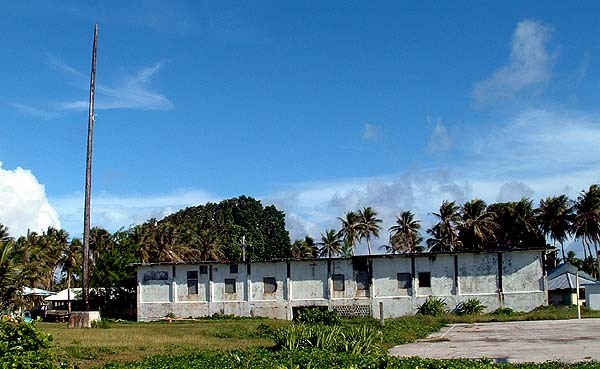 During this time, changes in other aspects of life on Ulithi were starting to take place, one of the most important being in the area of Education.